Ron lives in Wanblee, a community on the eastern edge of the Pine Ridge Indian Reservation. 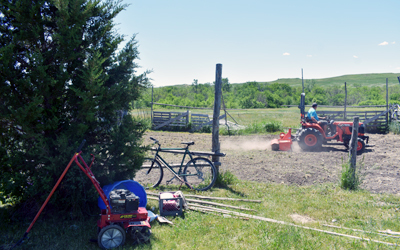 He was glad to see the tractor tiller pull up to turn the soil in his large garden. Finding his house was a little challenging, but it was worth the drive once we arrived. Ron’s land existed as a sprawling, rolling prairie piece of property where the nearest neighbor was a dot on the horizon. When our staff arrived, Ron had already dug up the garden on his own — by hand and a small tiller, but with the tractor he could really break down the large chunks that were still visible during our visit. The tiller also allowed for a small expansion so that he could plant all the vegetables that he wanted to grow this year. A military veteran, Ron lived off the reservation for many years. After returning, he noticed that there weren’t too many people gardening. It had been about 20 years since he returned home after serving in the Marines for 12 years, stationed in Camp Pendleton, Philippines, Okinawa and Iran. He injured his back in Iran, so gardening could be challenging, but the other health benefits made it worth the effort. 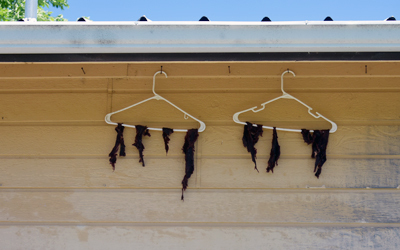 Venison hung to dry using plastic clothes hangers off the roofline over Ron's back door. Brussel sprouts — "Plant before the first freeze — the freeze gives it a good flavor — if not it's bitter." Corn — "Good luck! Corn is hard to grow; I've had one good year." Squash — "Blue Hubbard is the best but it's hard to get the seeds." Zucchini — "Great for bread." The tiller also allowed for a small expansion so that Ron could plant all the vegetables that he wanted to grow this year. 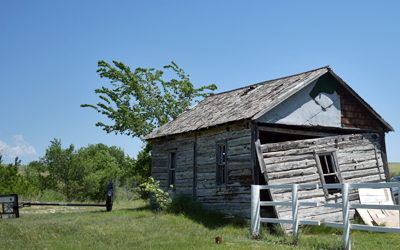 As visitors pulled into his property, they viewed an old cabin slowly crumbling to the ground. It was the kind of structure that you knew had a lot of stories and memories. Ron mentioned, “I was born in that house.” Ron’s wife, Rose, managed her quilting business out of another newer outbuilding. He explained that, “I started putting my tools in there,” but he was quickly shoed out when she reminded him of what this space was for — her business, not his rakes! An Inipi (Sweat Lodge) sat in the distance for their ceremonies to keep their minds and bodies healthy. Ron and his family valued food preservation. They fished in the summer for “mud cat,” another name for catfish, which was the best in Ron’s opinion. Venison hung to dry using plastic clothes hangers off the roofline over his back door. He even froze and canned food to get them through the winter. Ron shared his harvest with neighbors, mentioning that, ”the older people came out for the squash.” Of course, everyone loved his salsa which he reluctantly provided some vague recipe instructions: “30% hotter with jalapenos, onions, peeled tomatoes, boil together with some preservatives and cayenne and red Chile pepper.” It might be easier to just find his house and ask for a jar!